Here is another great glass bottle upcycling idea, besides glass bottle decoupage. It’s a glass bottle torch lamp. It is pretty easy to make and it gives your backyard an authentic and very distinctive look. These glass bottle torch lamps are very useful, too. They give enough light during the night and save you electricity. To make one or a couple of them you need to find suitable glass bottles. This one is from an energy drink. To make the torch out of it, you pour some vegetable oil in. Then you take a wine bottle cork and drill a hole it in. You make a wick. You may use a piece of rope for this purpose. You let the rope go thru the hole in the cork and down into the bottle. Once it touches the oil, it gets saturated with it and the oil ‘comes up’ through the wick. You may also make a hold for the torch lamp. My husband used an old clamp to hold the bottle. He just painted it with some bronze paint. That’s it. Your upcycled glass bottle torch lamp is ready. 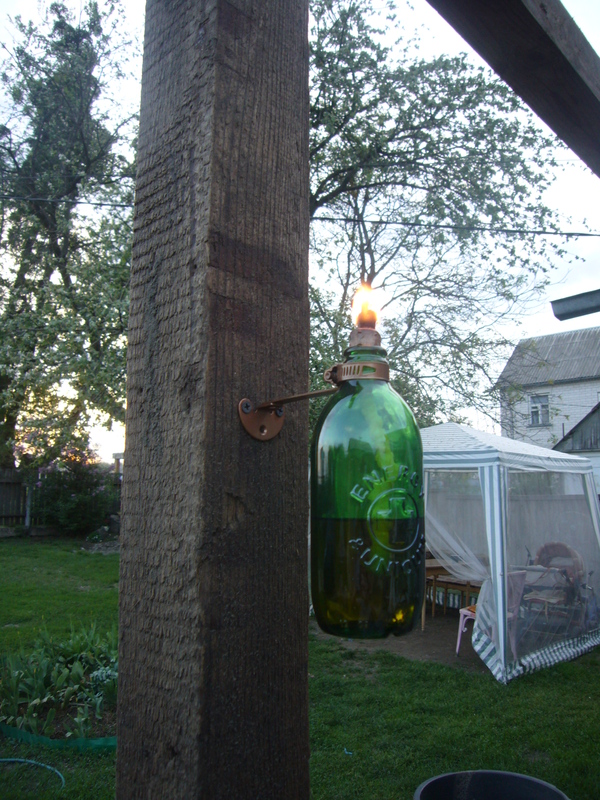 This entry was posted in Crafting Tutorials, Uncategorized and tagged backyard decor, backyard light, crafts, DIY, glass bottle, glass bottle torch lamp, glass bottle upcycling, green living, handmade, repurpose, upcycle, upcycling. Bookmark the permalink.